Chapped lips are the worst! I think I reapply lip balm 50 times a day! 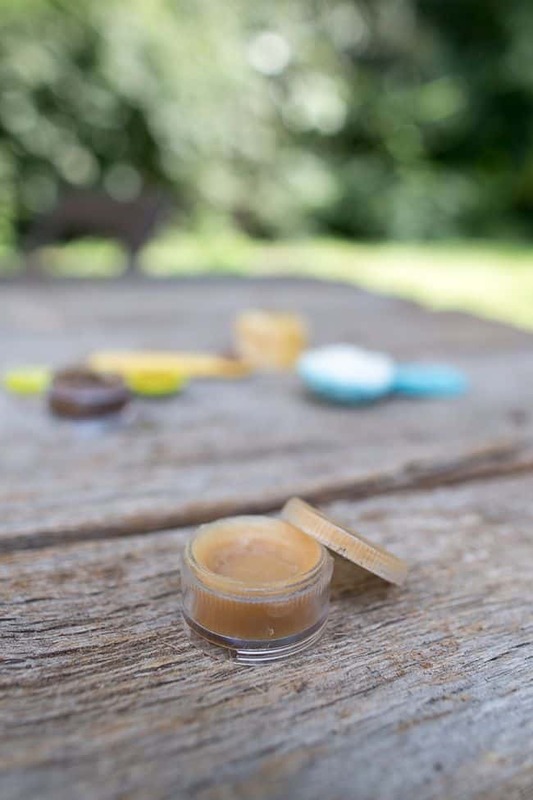 So here’s how to make homemade lip balm that will keep your lips soft and kissable all season long. 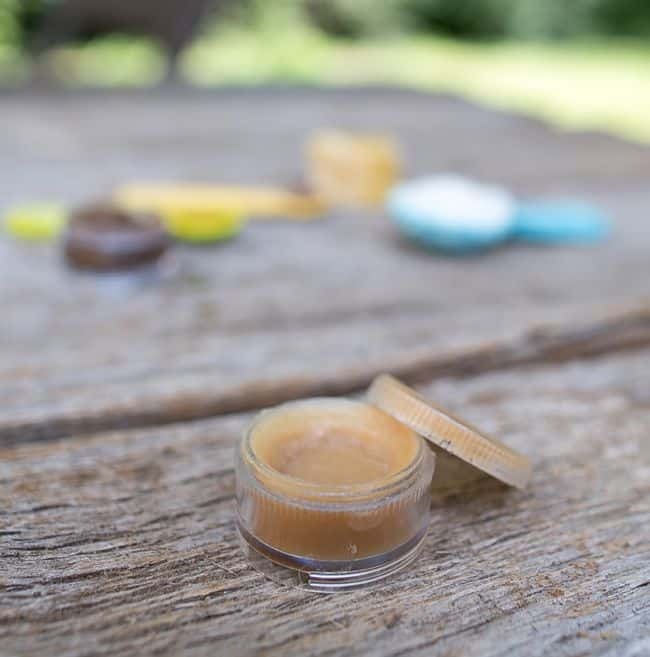 To get ready for chapped lip season, this year we switched up the recipe and added my new favorite ingredient (hint, it’s honey!). And who doesn’t love the taste of pumpkin pie? It’s my favorite dessert, hands down. (Then again I admit to being a nut for all things pumpkin spice.) 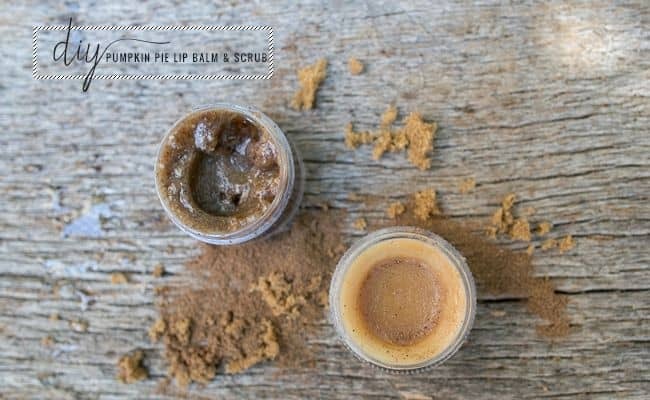 Last year I made pumpkin spice lip gloss, and it became one of my favorite parts of the season. . Oh, and we also tried out an edible lip scrub. Feel free to skip the pie and just eat the lip scrub! Combine ingredients together in a small bowl and transfer to a covered jar or container. This makes more than you need for a single use so keep the extra in a cool, dry spot or give to friends (they’ll love you). Apply to lips with your finger and gently rub back and forth. Finish with an application of pumpkin pie lip balm. In a double boiler combine almond oil and beeswax until melted together. Remove from heat and stir in the honey and pumpkin pie spice. 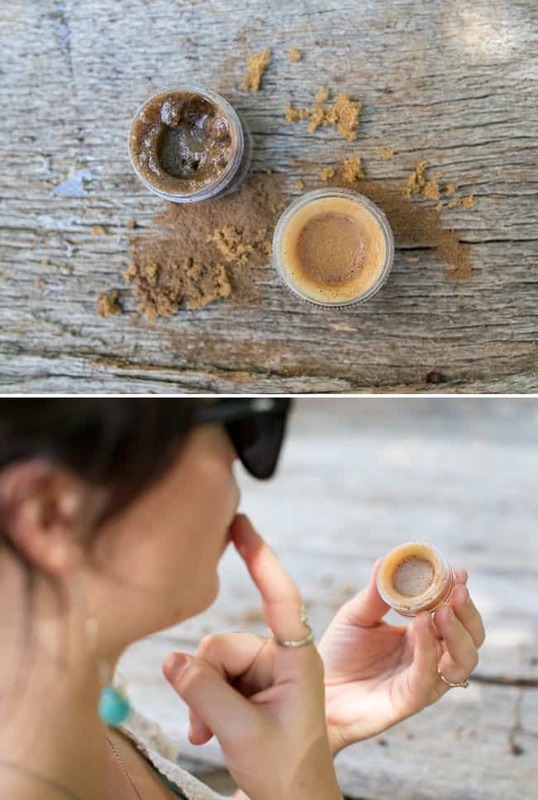 Once mixed, then carefully pour the mixture into a lip balm container. Let it harden and cool. This is the first time I’ve used honey in a lip balm recipe, and it’s divine. It smells heavenly, keeps the texture smooth and soft and, of course, tastes pretty good too. Making homemade lip balm is becoming my favorite fall tradition. That way I can enjoy my pumpkin spice all winter long! nice and natural lip balm! 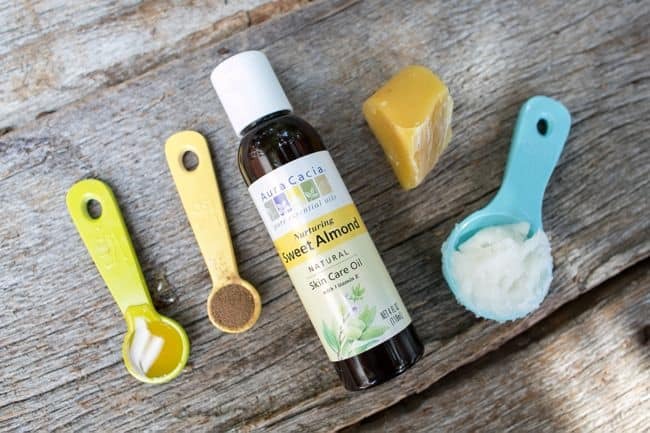 Can I use any other oil instead of coconut oil? I have never thought of using pumpkin for this. Can I use pumpkin spice mix liquid? or is it powder form? I really need a replacement for coconut oil. I want to make some but I am SUPER allergic. Do you have any suggestions? Try cocoa butter or shea butter. I use them for all sorts of things and they’d probably be a great substitute here. Hope this helps! I used vitamin E oil because I was out of coconut oil. Since we were all making our own jars we got to make 4 oz each. We melted the coconut oil and honey together in the microwave first then added the brown sugar and spice. Since we were kinda sampling it as we went along, we ended up with about 2 oz. It’s so yummy, do you think it would be tacky to serve it for dessert? Just kidding. Great balm and scrub. Thank you for the recipes. How long will the lip balm keep?? Could I refrigerate? I’d like to make some ahead of time as gifts. Is there another oil I can use as a replacement for coconut? I am allergic. Thanks! Sounds delish! I am allergic to almonds. Can you recommend replacement oils? I used Avocado oil, it worked and with the pumpkin pie spice and honey you can’t taste it. Did you happen to do a trial with coconut oil instead of almond oil for the balm? I have coconut oil and have used it before in lip balm, do you think the difference is very significant? I just happen to have coconut oil on hand and live out in the country so sometimes getting specialty ingredients is a bit of a chore. Hi Sarah – sorry you’re having trouble! I wonder if it’s the big batch you’re making? I’ve never had this problem when making on small scale. Have you tried warming the honey before mixing? On the lip balm in the picture you have coconut oil on the blue spoon but coconut oil is not listed in the ingredients. Can you give any more details? Oh! My mom loves it. I will never buy lip balm from the store EVER again. You could practically eat the stuff! Hi Nikki – sorry for your frustration! You can use light or dark brown sugar – either will work. And no, I didn’t melt the coconut oil first before combining it with the other ingredients. Even when solid the coconut oil has a soft enough consistency that you can easily mix everything together. But if it was easier to melt it first, that’s fine too! Hi Paula, the jars are repurposed from little pill containers from the dollar store! Question: how well does this keep??? I understand that honey is a natural preservative, but I’m unsure about sugar (it can go either way- bacteria breeding or preserving, depending on what you read…). I’m making my own lip scrubs and plan on sending them as gifts; hate for my friends to get sick! Hi Stefanie – the lip balm should easily keep for several months. 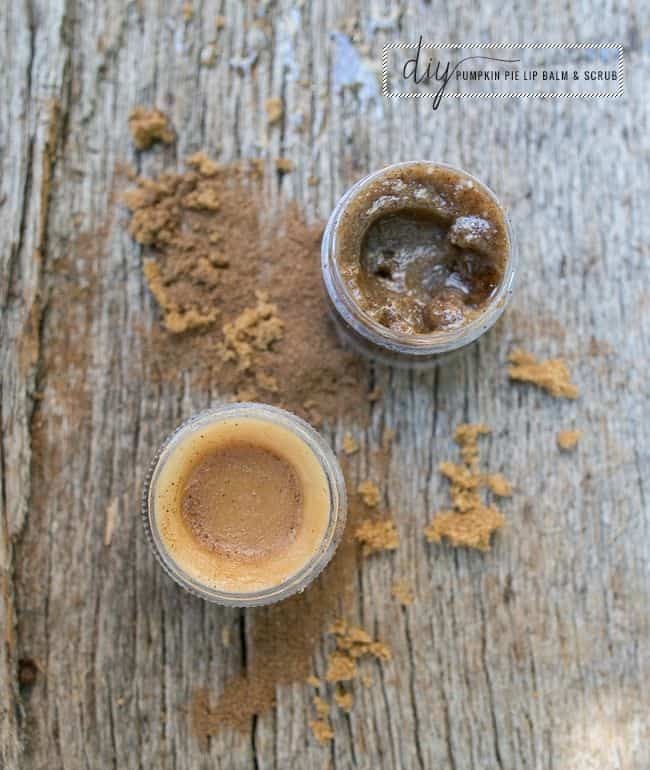 The lip scrub has a shorter life span – I would err on the cautious side and use it up in a month or so. Hi! I am from argentina, nowadays i am living in israel, but the thing is taht i don’t know what you mean with pumpkin pie spice? We dont have that, so what is it made by? Can i make it by my own? Thanks! Just in case, you still wanna know…. Pumpkin pie spice is a mixture of cinnamon, cloves, nutmeg and ginger. I’m seeing this recipe just in time for fall — I love it! To make a batch you just need to convert the measurements to parts (I did it below for you). 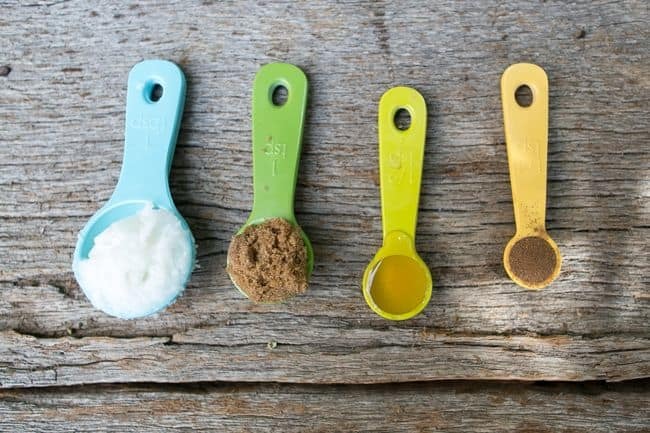 Then, you can use any measurement you want (tsp, Tbsp, Cups, etc, etc) and replace the “part” for your chosen measurement. Every time I make a lip scrub I think, why don’t I do this more often? It just feels so good. You know I would eat this, right? I would be spreading lip balm on my toast in the morning. This looks amazing! Ha! 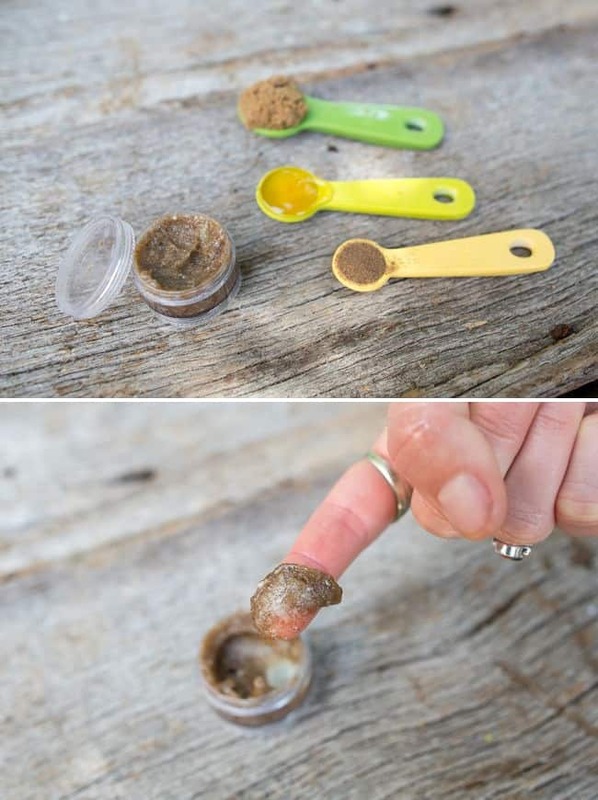 Lip scrub toast sounds pretty tasty! Ok, now I want to try that donut! I am a lip balm addict (seriously!). This looks awesome! Sounds yummy, too. Me too! I mean, when are they going to get a clue and keep pumpkin spice lattes up year round? Is there supposed to be coconut oil in the lip balm? It just shows it in the picture, so didn’t want to leave it out! Thanks for the recipe.